Adds a new character, and lets you fight the CPU. 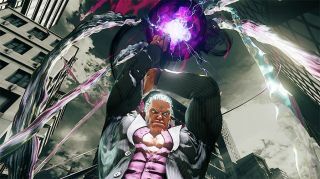 Street Fighter V is getting a big update next week that adds a new character, Urien, a 'Vs. CPU' function to let you fight in one-off matches against the computer (I'm a little amazed that wasn't in the game before now), new Daily Targets so you can earn a little extra Fight Money on the side, and Fighter Profiles so you can see how good or rubbish you are compared to your friends. Urien is the biggest deal of this latest update, of course, a fighter returning from Street Fighter III, and with a few more clothes. The Vice President of the Illuminati can be bought with Fight Money or Actual Money, and yep, he's included with the Season Pass. The update arrives on September 22, and you can read the full details of what's included here.